Blank walls are bland and boring- but think about the potential! Decorating walls with color and pattern can bring life to a room, create a focal point, and instantly add personality. Wall art can be expensive, and large pieces that make an impact like a canvas or a framed print are even more pricey. Solution– make your own piece of art! Not all of us are artists, but you don’t have to be one to create a masterpiece! This is an idea I stumbled upon on Pinterest, and put my own spin on it. 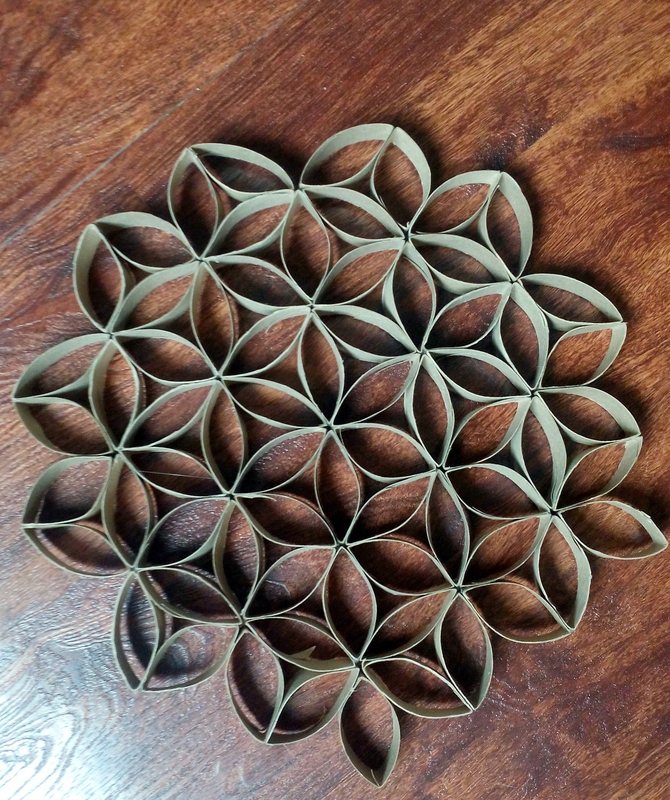 Basically all you need is a bunch of toilet paper rolls (the cardboard part) and some kind of glue to stick them together (I use hot glue). You can also paint it any color you want to personalize it even more, or if you are not a fan of the ‘Kraft’ brown cardboard-y color, but that’s up to you. P.S. 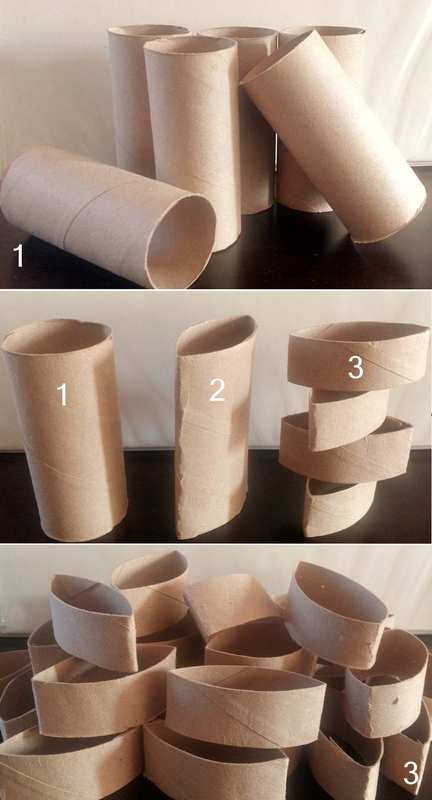 If you are grossed out by the idea of using toilet paper rolls, you can also substitute paper towel roll, or gift wrap roll. This idea is so exciting to me- it is practically free, it is reusing something that would otherwise be thrown out, it creates a visually stunning result, and it is really lightweight so is perfect for renters. 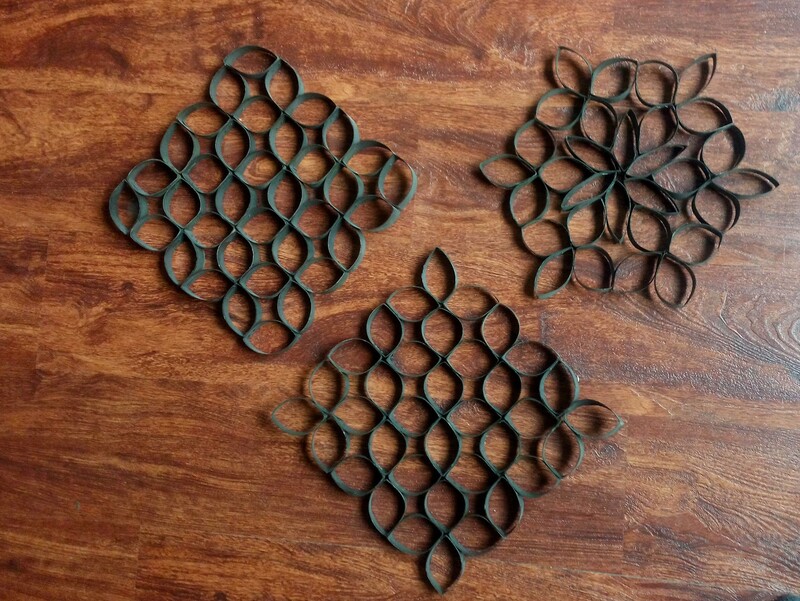 My first few attempts of this created a trio of geometric looking pieces, and when spray-painted black ends up looking like wrought iron! I had these up in our living room in our past 2 apartments, but it no longer goes with the look of our current place, so I set out to create a new piece for our bedroom- follow along! Step 1: Collect a lot of TP tubes. I mean a lot. Get your friends and family members to help in collection- they will probably look at you funny, but it makes this part faster! Step 2: Smoosh your roll and press it down to create an oblong ‘almond’ shape. This makes it easier to cut. Step 3: Cut your roll into even slices. You can measure it out, but I just eye-ball it. I get 4 slices per roll, but you can go thinner or thicker depending on your preference. 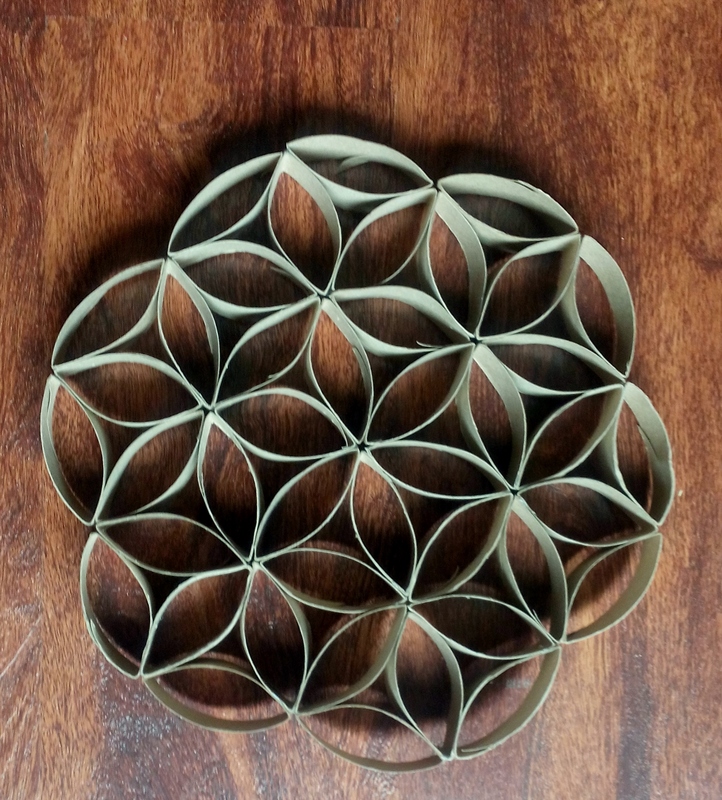 Step 4: Lay out your ‘petals’ and play around until you get the shape you like. I try to make sure each piece has at least 2 contact points with other pieces so that the final result is solid. Step 4: Glue your pieces together in the desired shape. Try and keep them level without rising on any one side. Step 5: Optional- paint or spray paint your finished piece. Make sure to go around each corner and inside each piece. Other options: This type of style would look awesome in a metallic color- think silver, or a soft copper. You can leave the joints as they are or add gems or beads to cover the center joints for a more finished and glam look. I am currently working on this piece for our living room, will keep you posted when it is all finished and painted, I’m thinking turquoise or teal! And that is all! I hope you give this easy DIY project a try. If you do, let me know! I would love to see the results!